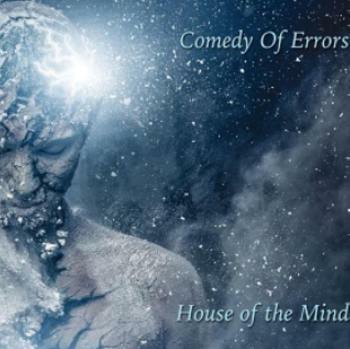 The Scottish act Comedy Of Errors return to the progressive rock scene with their fourth album House Of The Mind. It is the follow up to the excellent Spirit (2016, see review). The band continue where they left off producing a blend of traditional and neo prog with strong influences from Yes, Genesis and Marillion. As ever Jim Johnson (keyboards) provides the songs for this album but leaves plenty of room for the rest of the band to show their talents. They are Joe Cairney (vocals), John Fitzgerald(bass), Bruce Levick(drums), Sam Muculloch and Mark Spalding(guitars). The band produces a lot of energy. The first track, Tachyon starts with a solid riff but then builds into a pumping romp. Think Abacab or Turn It On Again from Genesis and you will get the feel. The lyrics are deep. "Time defines us, Time defies us " sings Joe Cairney," Spans a lifetime, then it flies", letting us know that our short spell on earth will be superseded by other such short spells. The second track is the title track and is the strongest on the album. No straight forward lyrics here also. "Proustian moments of sweet lasting madelaine ". Jon Anderson would be proud of that. The music flows back and forth with sweet moments and catchy melodies. A moments Peace is a nice slow building instrumental. The rest of the album is much of the same in as much as it contains great tunes, superb instrumental interludes and some thought provoking lyrics. Everything a lover of this type of music could ask for really. Highly recommended.